Classic Heavyweights 1970s: Intro, 1-100, 101-200, 201-300, 301-328 + named. The 1978-79 expansion continued all the way up to reference 322 Iran, who were added for the 1978 World Cup. 1980 saw just six other kits added to the range. However, a more important introduction was the lightweight figure, a new (and much improved over the zombie) machine printable figure, which signalled the end for the heavyweight. The vast majority of sets released for teams 323-328 do seem to be hand painted lightweights, although heavyweights have been spotted for a couple of the teams. The 1981 range sees the first classic machine prints on the new lightweight, of which the complicated 329 England is a stunning example. In England, this range invariably turns up in the lightweight figure, but the Italian catalogues of the early 1980s do still show some of these kits in heavyweight form, and these have been added to this page for the sake of completeness. If anyone has a heavyweight in these colours, please let me know. The final part of this page tries to help identify any heavyweights not in the numbered range. Dating information - the date in brackets is the final year that a team appeared as a lightweight figure. Please note that this team is not the standard Subbuteo sky-blue. England 1977-1980 Also in C500 etc. Paris FC (France) This original 1980 design has been seen in a heavyweight figure. The 1981 Range - Teams 323-359. As I have mentioned before, the Italian catalogues of the 1980s-90s are illustrated with actual figures, with these being a mixture of heavyweight, lightweight, and hybrid figures. Some of the teams in the 323-359 range are clearly illustrated with standard heavyweight figures, and it is understood that a few teams were sold in this figure in Italy. The very dark red of this kit seems to be drawn from the zombie pictures of the 1981 catalogue which show most of the reds on the final page as a wine red. This kit should have white sleeves with mauve trim. Whilst looking at the 1981 range, this extra group of teams needs to be mentioned. These were originally produced in Italy, and so could fall into the heavyweight era. However, early versions are usually in the Italian hybrid figure rather than true heavyweights, and you can see these on the Italian Production page. As any heavyweight collector will tell you, the Subbuteo number range is not the whole story of production. Although the Subbuteo numbering system remained intact until 1996, SSG did release teams in named boxes from time to time. Most of these eventually made it into the standard numbering system, but a few did not. The aim of this section is to highlight and illustrate teams that don't appear in the regular lists. The main source of these teams, was probably the C100 (and R100) Special Service provided to retailers. 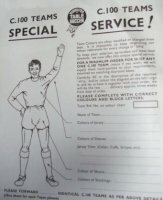 For a minimum order of just fifty teams, a retailer could request any club name and kit that he wanted. The delivery time was impressive - "approx three weeks from date of order". The leaflet (shown above) explains that "Team colours are often modified or changed these days. It is impossible to keep re-printing our colour references for every change in "strip". To keep your selection up-to-date and meet local demands, we now offer this unique special service". Most collectors assume that it is the "typed named boxes" of the early 1970s that were produced under this service. Whilst potentially exciting for modern collectors, care must be taken. Firstly, updating teams with the latest trim, or colours was something that kids in the 1970s were happy to do themselves. I have seen many corrections and adaptations along these lines. Sometimes the changes are small, and it isn't easy to tell when it was added. Examples of trim additions might be white collars and cuffs on Uruguay, or yellow on Crystal Palace. 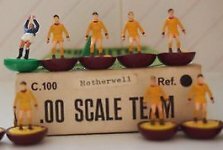 Of course as Subbuteo was hand-painted using basic humbrol colours, the 1970s re-painters were often using the same paint. Even more problematic is the "modern" re-painting of kits - usually for profit by unscrupulous collectors and dealers. This has happened for as long as Subbuteo has been collected (i.e. at least since the early 1990s). The difference in price between a common team and a rare one has become so great, that so called "unique" teams must sadly be approached with some level of suspicion. And as these re-painted teams get older, and pass through the hands of more collectors, the problem is only going to get worse. In assembling this list of "named" teams, I have not included every possible rarity that has been sighted. 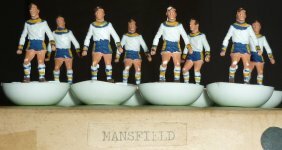 I've used my own experience, and those of other collectors to show those teams that have a certain Subbuteo style/colour to them, or those that have appeared on more than one occasion. We are not infallible though, and each side here must be considered on its own merits. The logical reason behind this first set of named teams must have been that Subbuteo would only be selling them for a short time (until the next World Cup), so did not want to to put them in the regular list. Sixteen sides qualified for the 1966 World Cup but the Subbuteo range had 17, as North Korea received two alternatives; either red like ref.1 or dark blue like ref 44. The teams were originally produced in the old short sleeved figure, but later versions appeared in the classic heavyweight which arrived circa 1967-68. See the World Cup appendix for full details of these teams. However, which teams were produced as classic h/ws is not yet clear, as Subbuteo had simplified the list by 1968. The original list gave individual named kits for all 16 teams, but by 1968 the list told customers to order teams from the standard range for 9 out of the 16 countries. Obviously, there were more anomalies in the original list. A good example would be France who have red socks originally (similar to reference 149) but the 1968 list advised punters to purchase reference 2. So the main question is: Was the original list also produced in the long sleeved figure? Evidence is awaited. This leaves the 1968 list, and there are two teams worthy of mention here, which have been sighted. The key team is Hungary, described as wine red shirts, white shorts and green socks. Although a Hungary side does finally reach the numerical list as 281 in 1978, this may not have the rich wine red jersey of this original version. The other variation is a West Germany which has reversed socks when compared with the later ref. 156. All of this sixteen team range eventually made it to the numerical range, and once again full details can be found at the World Cup appendix. I have heard that a seventeenth team was produced in this range - Honduras. The story being that when the range was launched it was not known whether Honduras or El Salvador would be making up the numbers. Plastic Strip/Printed Name boxes - late 1960s. These name strips are identical to the World Cup team labels, so see Hungary (above) for an illustration. The most common team with this style of label seems to be West Bromwich Albion, and the team is identical to the standard reference three. West Bromwich won the FA Cup in 1968, and it is possible that this box ties to this (although an away kit was worn in the final). I have also seen "New Wolves" in this style (simply ref 77). This is a strange era for Subbuteo teams, as some new sides make the team range, and others only appear in named boxes. Issuing short runs of teams in named boxes may have been a logical response to increased unique kit experiments, that left teams in the numbered range "out-of-date" before they had even arrived. This might have been triggered by the 1970 range additions. Among these, Montrose stopped wearing ref 63 that year, Clydebank (73) had actually stopped wearing red shirts in 1969, and Forfar's hoops (75) seem to date from 1968. That said, named boxes were not used as a long-term solution. 1971 saw a few away kits added to the number range, and 1972 saw Birmingham (101) and Crystal Palace (102). It is also possible that these teams were special orders by sports shops (See above), although the Derby County seems common enough to question this. England 2nd (illustrated). Actually a third kit, this all sky blue outfit was an alternative for the 1970 World Cup. However, the named box says England 2nd. Halifax Town (illustrated). Worn 1970-71. Tangerine and light blue? A lovely base combination. Manchester City* (illustrated). A more accurate version than reference 5, with sky blue socks, and white trim. Northampton Town (not illustrated). Two claret hoops on the shirt, white shorts and socks. Worn 1967-71, and predates ref 61. Southport (not illustrated). Simply all tangerine. Like a ref 49 with no trim. Worn 1965-71. * Note that the Manchester City is in a later box type than the other teams. Most of these teams appear in the early 1970s long box, with plastic handled goalkeepers. However, the Manchester City shown is in the later mid-1970s box. Even with this anomaly, it is worth reiterating the tight date range many of the kits in this section were worn in. According to the wonderful Historical Kits website, the final appearance for four of these kits was 1971. I'm expecting more teams to turn up, hopefully including Scottish sides. An interesting oddity with regard to these teams is shorts trim. As a rule, shorts trim does not appear on teams in the numbered range until the late 1970s (Middlesboro at 171 are probably the first). However, an early version of reference 53 Portsmouth with shorts trim is well documented by Mike Peacock on his Little Plastic Men website, and the named box Derby, and Mansfield also have this trim. Thanks to Jamie Ballard, James Sheldon, Jon Rosten, and Nick Samson for their help with this list. This is the next confusing era of Subbuteo production. The English catalogues seem straightforward, with the range staying at 190 for three catalogues - 1974/75, 1975-76, and 1977, but new team production did not stop. The Italians produced teams in the 501-528 range which are found on the Italian Production page, all of which eventually found their way into the 1978 range expansion. Another group of teams to appear at this time are more named sides. Most of these teams also found there way into the standard team range, but took a little time settling down on a number. By this time, the box type has altered to the mid 1970s long box, and a new type of naming has arrived - where the name was stamped onto the box. To add to the confusion, printed name stickers were still used, and seem to become the norm once the small late 1970s box arrived in 1977. These named teams are usually in the long box, but this is not always the case. Most of the teams go on to appear in the number range between 190 and 210, but Norwich finds its way back to 28, and Southampton doesn't make it to the standard list at all. Note that these are the later boxes with "OO Scale Team" on the end, rather than "OO scale players". New Burnley. The later version of ref 170 with large sky blue "V"
New Leeds Utd away - also ref 191 and later 208. New Southampton - See above illustration. This team doesn't make it to the team lists. New West Ham United - The classic Admiral version. I've seen a long boxed h/w version stamped as ref 195, and a small boxed zombie side with a simple "West Ham" label. Eventually became ref 209. New Wolves. This seems to have been used on both reference 77, and then later 211. The number of teams of this vintage with stamped named boxes seems to be growing. This Manchester Utd 2nd team eventually became reference 325 in 1980 (with a simplified trim), but here it is as a named box side earlier in the 1970s. I have also seen the Plymouth team that became reference 199 in a stamped box. An updated England kit with red and blue trim was introduced as C138 in 1977, and was joined by the rest of the home nations in the C500 range in 1978. However, it seems that the new Wales and Scotland pre-date C500. Wales has certainly been seen as "New Wales" and Scotland also has a 19x number. New Wales. Also seen on ref 192 before becoming C500 and then 319. Scotland. Was 193, and then C500 and then 318. A named team is therefore likely. Northern Ireland changed to green shorts (from 157) whilst being a C500 team, so a named box version seems less likely. Scottish club sides seem to be a bit thin on the ground in collecting circles, so tracking variations is difficult. The teams here are both in the mid 1970s long box stamped with the team name. The team on the left is stamped Aberdeen and the long box means that it predates reference 198 which it resembles (the difference is that this team has one stripe instead of three, and the stripe does not carry onto the shorts). December 2012:- I've also illustrated a named box Dunfermline, which seems to match the Aberdeen rather nicely. 2014: Pleasingly, the Scottish named-box sides of the period now seem to be coming together nicely. The Dumbarton kit later released as reference 356 first appeared as a typed-name team in the mid 1970s. The Motherwell in plain Amber with claret collar and cuffs, which is usually regarded as a variant on reference 49 has also been seen in a typed-name box. The fully trimmed Partick Thistle (worn in 1975), the "Ajax" style Hearts kit (worn 1972-73) both appear to be part of this range of teams. The final team shown is a kit which Mike Peacock has listed under ref 181. I've seen this one before too, and it is usually regarded as a variant St Mirren. St Mirren wore a black version of the "Ajax kit" (also in 1972-73), and this could be Subbuteo's attempt at that. The difficulty is not just finding these teams, but finding them in the correct named or numbered box. Sadly, even a copy of the Hearts which was still with its original owner was bought with no name or number on the box. Melchester Rovers are, of course, the team Roy Race plays for in legendary comic strip Roy of the Rovers. I can remember this team being advertised for sale in the comic around 1979-80, and I'm sure it had a heavyweight player on the advert. A long box version would likely come from the mid 1970s, and I suppose it could have had a shop request. Of course, it could well be a repaint (painted onto a ref 41, it would be difficult to tell). It is a strange one, as various site visitors have been sure they saw or owned this team at the time, and yet they don't turn up in collecting circles. The lightweight versions are not that uncommon, so you'd think we'd see more of this team if it had been made available. If you have an odd solitary player that you've been unable to identify and you've reached this point, then it is possible that he is a spare goalkeeper. There are probably lots of different spare goalkeeper kits, but the ones in the above picture show some common themes. The green 'keeper with red sock tops is illustrated in the 1969 catalogue. Sometimes both goalkeepers are the same, and sometimes his partner is in reverse colours i.e. red jersey and green sock tops. As an alternative, the yellow goalkeeper (with blue sock tops), and the blue goalkeeper (with yellow sock tops) exist, but are less common. Later 1970s spare goalkeepers tend to have black shorts, with shirts and socks in one of the standard colours (thus matching the diving goalkeepers of the time). The ones illustrated are blue and green, but in my youth I had a red shirted one (I sat on him - oops), and I expect yellow also exists. This final section is for heavyweight teams that appear in catalogues from other countries. It is known that the French had there own factory, and produced a different range of teams. There are also anomalies in the 1970s Dutch catalogues when compared to the standard 82-89 range. However, at present I don't have any pictures or details for this section.